Go river rafting on the Balsa River during this 6-hour transfer from San Jose to Arenal. No experience is necessary; certified guides will teach you and lead the tour. Lunch, fresh fruit snacks, and beverages included. Pickup in San Jose and drop-off in Arenal included. Pick up at hotels in immediate San Jose area. Additional charge for hotels outside of immediate San Jose area. Be ready for pickup at your San Jose hotel at 8:30am. Bring a backpack and some toiletries for the day; storage is available above your seat. Watch out the window as you pass by stands of papaya and yucca; make a rest stop to stretch your legs and see some local iguanas. Arrive at the launch spot for your river rafting adventure, meet your guides and get a basic orientation. 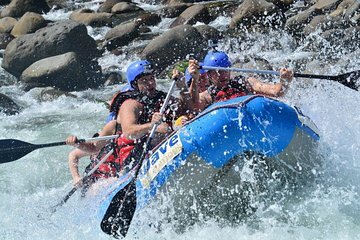 Learn some rafting commands and get outfitted with a life vest and helmet. Set out onto the Balsa River, passing over rapids such as 'Dredges' and 'Magnetic Rock'. During the 2-hour journey, watch for sloths, toucans, and monkeys. Stop for a swim and a snack of some local tropical fruit. Arrive at a typical Costa Rican country estate for lunch, then depart for Arenal, arriving between 4pm and 4:30pm. Not responsible for items lost or damaged on river, please do not take anything on the river that you are not willing to lose.